Jockey’s Ridge Crossing will be hosting the Annual Sunset Festival this year running from June 10th to September 1st. Make it a fun trip to Jockeys Ridge Crossing to experience their nightly events, shopping, sweet treats and walk up the sand dunes to experience the serene sunsets. The Outer Banks has one of best places to view the evening Sunset on Jockeys Ridge Sand Dunes. Stop by the Kitty Hawk Kites Store to pickup a kite to fly while watching the sunset. Life on a Sandbar has a little bit of everything, including sand art projects, cool hair wraps/braids and beautiful jewelry. Try some of the best homemade ice cream on the Outer Banks at Scoops and some amazing fudge at the Fudgery. Kitty Hawk Surf Co. has great new items from Salty Crew, Vans, Hurley and more. to some of the best deals for Hobie Kayaks. Stop by Natural Life for some great good vibes product and take your photo in front the new mural! Take your photo with one of our majestic mermaids and pick out a shell to receive a discount for Scoops Homemade Ice Cream. Dance and groove the night away with DJ Christian Benedi! It’s Game Night- come try out some of our fun new games that will have your family and friends laughing and smiling all night long. Let’s go fly a kite with the Outer Banks Kite Club. Fill the sky will color while watching the magnificent sunset on the sand dunes. There will be professional kite flyers that are there to help teach you some tips and tricks on how to fly your kite. 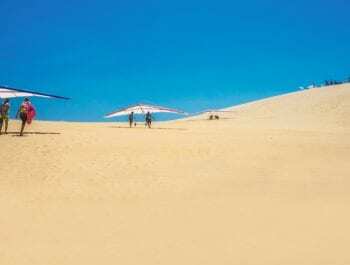 Jockey’s Ridge Crossing Jockey’s Ridge State Park Kitty Hawk – Kitty Hawk Kites Private: Kitty Hawk – Kitty Hawk Surf Co.